There are few world coin products as popular as the 1967 Canada proof-like coin set. It was among a long-running series of annual proof-like coin sets that contain one example of each denomination of Canadian coins minted in the 1960s, including the one-cent coin, nickel, dime, quarter, half dollar, and silver dollar. These aren't just any Canadian coins, though. They are the six coins that commemorate Canada's 100th anniversary of confederation. When it was released, the 1967 Canada proof-like set achieved a huge following not just in Canada, but also in the United States. There are several reasons why the 1967 Canadian proof-like set became such a popular collectible. The 1967 Canada coins consistently rank among the most beautiful the Royal Canadian Mint (RCM) has ever released. The artistry of the 1967 Canadian coins has even inspired the RCM to reproduce the designs on 2017 Canada coins that honor the nation's 150th anniversary of confederacy. 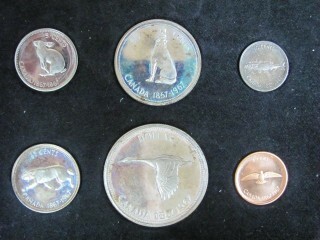 High silver content – The 1967 Canada set contains four coins that have an 80% silver composition. These include the dime, quarter, half dollar, and dollar coin. Combined, these four coins offer a total of 1.1 ounces of pure silver content. While the 1967 proof-like set typically costs much more than the base silver spot price, it nonetheless is a popular buy for silver stackers. Patriotic themes – Whether or not a collector is Canadian, he or she can appreciate the soaring patriotism on the 1967 Canada coins. For the Great White North, patriotism is often symbolized not just in monuments, but also in Mother Nature's uniquely Canadian touches. Some of this planet's most beautiful creatures are indigenous to Canada, serving as iconic symbols for the nation. Among these are animals such as the Canada goose, which soars the skies over much of its native North America and is named after its breeding grounds in Canada. A timeless collectible – The 1967 Canada proof-like set gained huge popularity in the United States in the years following its release, when American numismatists were starved of new, collectible coinage. From 1965 through 1967, the United States Mint had halted production of traditional mint sets and proof sets, and temporarily abolished mintmarks from coins to help dissuade collectors from removing coins from circulation during a national coin shortage. While the U.S. also no longer produced 90 percent silver coins (which were last minted for circulation bearing a 1964 date), Canada's proof-like set offered gorgeous coins with significant silver content. The bullion merits of the 1967 Canada set, along with its beautiful designs, satisfied the numismatic hunger of a U.S. coin collecting public that had grown bored with America's new coins of the era. Coin collecting trends change, yet it seems Americans never really forgot the 1967 Canada proof-like set. While five decades have passed since it was issued, the 1967 Canadian proof-like set remains a favorite collectible that any hobbyist who appreciates classic coin designs and iconic world coinage should add to his or her collection.